This month we continue our series to honor the veteran members of Branch #191, and will acquaint you (or reacquaint you), with Comrade Hugh Wright. Hugh was a free passenger on the ship that brought his parents from Scotland, being born shortly after that in Montreal on April 2, 1923. A few years later his parents moved their six boys and two daughters to the Cowichan Valley where his father continued working as a police officer but later switched to farming. When he was old enough, Hugh took a job logging. At the start of the war, he and several other lumberjacks headed into town then returned to the camp in military uniforms. He joined the 1st Canadian Naval Commandos and soon shipped out to Europe. He sailed for England in the belly of the Louis Pasteur, a trip he doesn’t recall with much favor. The privies were simply large cones welded to the hull that opened to the ocean. Hugh was always careful in their use as a slip could result in a very serious flush. He was amongst the first wave of soldiers to land on Juno Beach during D-Day. Twice wounded, once by bullet fire and once by shrapnel he was taken to an aid station, patched up and then he headed right back to the front. He no longer remembers the details of where he fought but he carried on through France and was in Belgium when the war ended. Despite his youth at the time and the many years between then and now, Hugh still honours his comrades in his heart. When he shipped back to Canada he sailed on the Queen Elizabeth. Even though his aunt, his mother’s sister, was a chambermaid to Queen Elizabeth, Hugh received no special treatment.. As he and a comrade descended the gangway to the jetty, they were spotted by a young Lieutenant who promptly threw them in jail because they weren’t properly dressed. After a few hours in cells, a Captain came in, saw what had happened and stated to the arrester “Don’t you know who these guys are and what they have done?”. He arranged for their immediate release and then for transport to get them home where their families were anxiously waiting their return. Today Hugh lives in Cairnsmore Place in Duncan where he is attended by his wife Ruthie, many friends (Lynda and Rolph assisted during our interview) and caregivers. Recently, he and his wife returned to England and France to walk distant memories and reacquaint themselves with their heritage. It is with sadness that we announce the passing of Hugh Wilson Wright at Cairnsmore Place. He was predeceased by his parents and five siblings. He is survived by his sister Margaret, nephews in the Cowichan Valley, niece Lynn in Comox and his loving spouse and caregiver Ruthie and extended family. 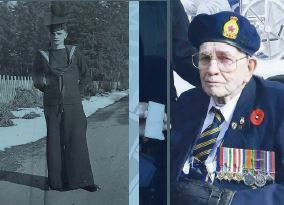 Hugh was a decorated WWII veteran who landed at Juno Beach on D-Day. He was a long time member of the Royal Canadian Legion, Branches 53 Duncan and 191 Chemainus. He was a charter member of the Fraternal Order of Eagles in Duncan and a member of the Royal Canadian Naval Association. Hugh was a long time valued member of the Legion Pipe Band and a founding member and huge supporter of the Cowichan Pipes and Drums. 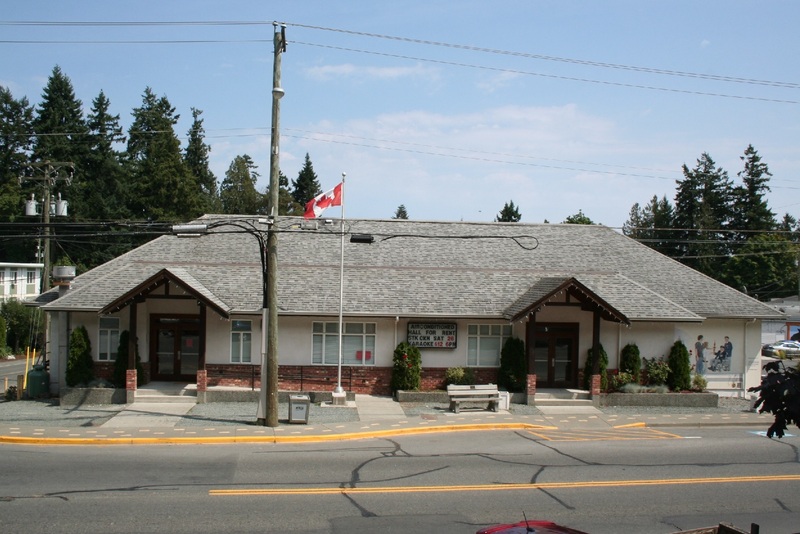 A memorial service will be held Saturday, July 21, 2012 at 4:00pm at the Chemainus Legion. Many thanks to the staff at Cairnsmore Place for their loving care for Hugh. In lieu of flowers donations can be made to Cairnsmore Place or a charity of your choice.